Also referred to as a Double Needle. 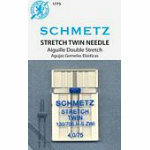 With a medium ball point, the twin stretch needle is well suited for sewing dual rows of stitches on both knits and elastic or stretch fabrics. System: 130705 HS ZWI. Needle Distance: 4.0mm. Needle Size: 1175. 1 needle per pack. Carded.